Virtual Business Tools and Tutorials Philippines. Your Online Guide for Digital Marketing, Internet Marketing and Virtual Professional Business. Last month I created a survey inside Virtual Business Matters Facebook Page by asking a simple question, "What internet browser do you use?" and then I promised that if I got 100 responses I will post the result in virtual business matters blog. As promised, here's the result of the most commonly use internet browsers. Disclaimer. The result of this survey doesn't reflect or represent all the internet users in the world. I just thought that 100 is a good samples. If you want, you can create a similar survey and let's compare the results. Here's the Top 5 Internet Browsers [Virtual Business Matters' Facebook Page Survey Results]. The result is not really shocking for me. 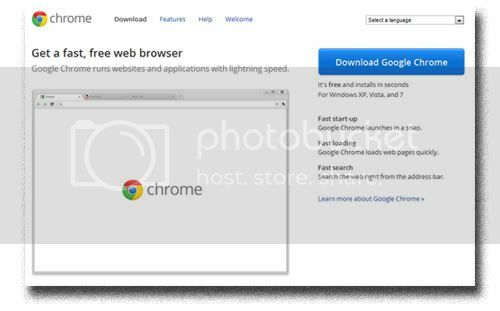 It's more of an anticipated result on my part because I am using these 5 internet browsers from time to time, sometimes if I have internet projects . Again, these are the top 5 internet browsers based on Virtual Business Matters Facebook Page survey. 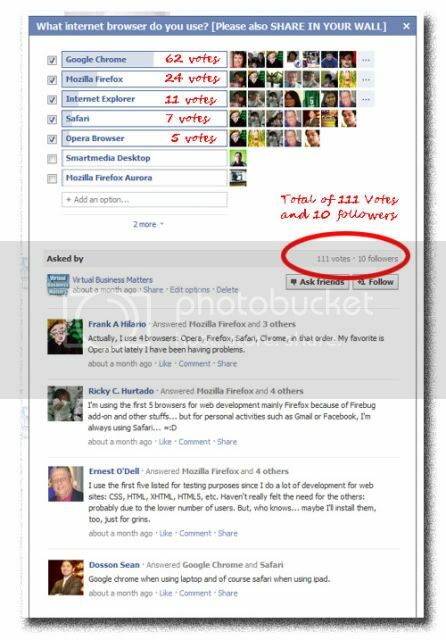 The image below is a snapshot of the actual survey inside Virtual Business Matters Facebook Page. The survey received a total of 111 votes. Google Chrome, my favorite browser, as anticipated, is on top of the list with total vote percentage of 55.86%. That is more than half of the respondents. Firefox got 21.62%. 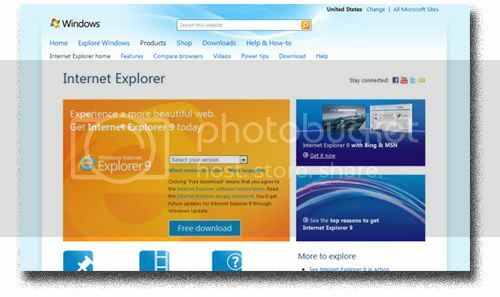 Internet Explorer is 9.91%. Safari got 6.31% and on the fifth rank Opera which only got 4.5%. Notice that some of the respondents are using more than one internet browsers. You may be wondering why need to install more than one internet browsers. Some of them responded four, others five internet browsers. 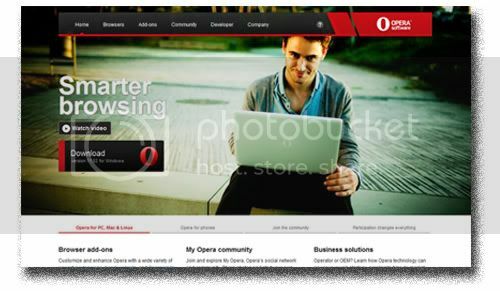 If you are a website programmer or a website designer, you need not only one. If you're maintaining a blog, here's my tip you need more than one internet browser. Website loading verification is the key. You need to test if your website will work in different internet browsers. 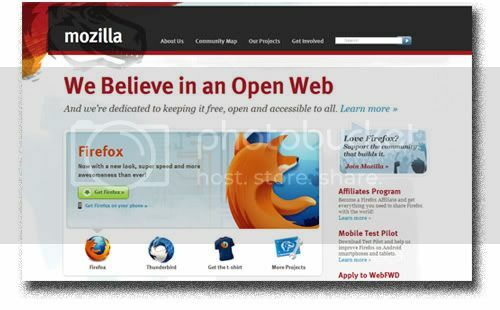 Aside from testing a project website, executing more than one internet browsers at the same time have some advantages. I'll tell you that in my future blog post. 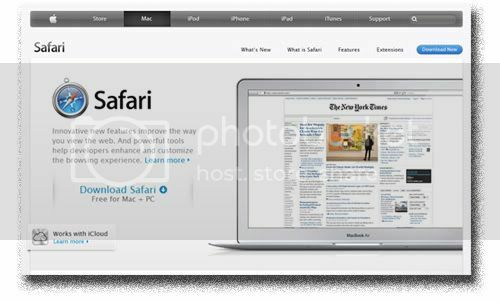 The possible title could be, The X Advantages of Using Different Internet Browsers Loaded at the Same Time. Wait for that, but if you can't wait, you can leave a comment below and tell me what are the possible usages of loading one internet browsers at the same time. 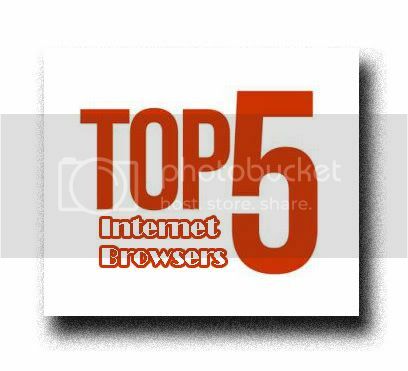 There you have it, the Virtual Business Matters' Top 5 Internet Browsers. If you have additional comment, please leave your decent one below. If you want more tips and tutorials about internet marketing and virtual business matters, GIVE US a "LIKE" on our Facebook page. You may Go HERE: Virtual Business Matters Facebook Page. Thanks indeed. Been using Firefox since then, what I like about FF is that it has lots of add on features that I really need and help my work. Google chrome all the way!! i go for everything that does not slow down my laptop ksi eh. hehehe. chrome works best with other programs. That's right Charm. Thanks for dropping by. In terms of compatibility, Yeah, Google Chrome works so well compare to other internet browsers. I used Firefox before because of the very useful addons that but now that most of it can also be installed and used in Google Chrome, I totally switched to it. Don't be the last to know, subscribe now!